Ann Lynn Smallwood Lambousy, 60, of Spring, TX passed away on February 8, 2019. She was born December 14, 1958 in Paris, Texas to James and Frances Smallwood. She was a very loving, caring, and generous person. Helping others was one thing she lived for. She loved all animals, including her beloved dogs and cat. She was a champion for any animal, especially the weak and defenseless. 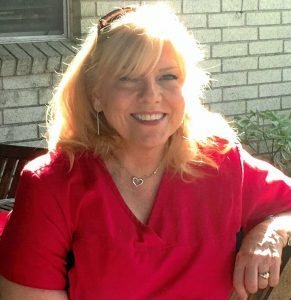 Ann worked for GE Betz for many years as a Lab Tech; she graduated in 2009 from Lone Star North Harris County Nursing School with a Bachelor’s in Nursing. She is preceded in death by her parents and her husband of 23 years Gregory Lambousy. Ann is survived by her two sons: Jacob McDonald (Krissy) and Justin White (Erin), sister Jamie Blalock (John) and brother Jack Cooper, her six grandchildren: Ryan, Hannah, Kylee, Jace, Colton, and Noah McDonald. A visitation will be on Friday, February 15, 2019 from 5:00pm – 8:00pm at the James Crowder Funeral Home in La Marque. Funeral Service will be held on Saturday, February 16, 2019 at St. Michael’s Episcopal Church in La Marque at 10:00am with Father Bob Moore officiating. Interment will follow at Hypolite Perthuis Cemetery in Hitchcock, Texas. Pallbearers will be Scott Perthuis, John Blalock, Ryan McDonald, Steve Cole, Forrest Walker and Michael Cole. Love you and I will miss you my dear sweet friend. The kindest, best friend anyone could wish for- the “ sister of my heart” , champion of of every person she cared for and touched in this lifetime. We will all feel the giant hole in our hearts that her absence from this world leaves. Our comfort will be forever remembering her love, laughter and the beautiful spirit that floats above us offering peace and love for all eternity. With every monarch butterfly , bluebird or flowering plant we see can remind us of her and the gifts she shared with us. May her children and grandchildren blossom in her teachings and the beatiful soul that once shared time on earth with us – gone from the living much too soon, but never forgotten. She has gained her wings and now joins her beloved husband, Greg, in everlasting love God’s kingdom watching over all her loved ones. Our tears will stop flowing eventually and will all feel the love flowing from her soul wrapping us in a cocoon of love . To Ann Lynn’s family, I’m deeply sorry for your loss. Our Heavenly Father Jehovah promises that you will see her again very soon! Acts 24:15, John 5:28,29. She will also be in perfect health Revelation 21:1-5. So sorry to hear this. Good thoughts going out for her and Jacob and Justin.